For the record: The official White House transcript of the speech made the correction without mention of the mispronunciation. (You can hear for yourself in this video.) But that hasn't slowed a barrage of coverage making light of the president's mistake. One example: At CNN, Anderson Cooper referred to Nambia as a "magical land far, far away" in his recap. Namibia 101: The gaffe has led to a slew of civics-type primers about Namibia. Time, for instance, notes the tiny nation of fewer than 2.5 million people is relatively young, having achieved its independence in 1990. Among the factoids it highlights: Namibia is a big producer of diamonds and it has environmental protection written into its constitution. Silver lining: "If Trump's blunder was worth anything, it was this: The world now knows about Namibia," writes Luis Gomez at the San Diego Union-Tribune. He notes that Namibia also is one of the top global producers of uranium. The main point: The gist of Trump's speech was to tout the region's economic potential (he said he has friends who go there "trying to get rich"), and a member of the African advocacy group ONE praised the intent. 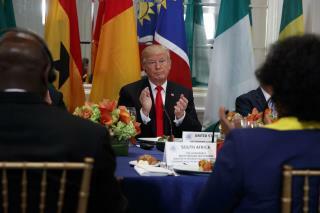 "I know 'Nambia' will be the narrative that comes from those remarks, but POTUS is right on this: Africa has tremendous business potential," tweeted rep Ian Koski. Namibia's reaction: Officially, nada. No major government official, including President Hage Geingob, who was present, has said anything publicly about the mistake. But the Washington Post reports that Namibians themselves sound a little miffed and are mocking Trump, like so. Ain't he a kl0wn? He once said 7-11 instead of 9-11. His reading ability is some third grader. Vocab is about that grade too. He graduated from some university, sounds dubious like his defunct university. Namby Pambia ... Its where cowards and their temporary bone spurs migrate to.